CONGRATULATIONS TO ALL THE WINNERS AT THE WORLD SHOW. THANK YOU TO SOFIA OLSSON FOR ALLOWING ME TO USE THE PHOTOS. 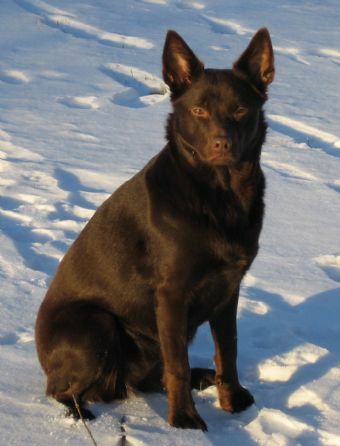 Marika Elmersson of Whyalla's Kennels, Sweden is the owner of JWW-03 SUCH NUCH DKUCH NORDUCH INTUCH WINGDARI OUTBACK DREAM "Jaffa". Marika and Jaffa have also qualified for level 3 in tracking and in obedience. Jaffa is Junior World Winner at the World Winner Show in Germany 2003, Swedish Champion, Danish Champion, Norwegian Champion, Nordic Champion and International Champion. Jaffa has been health tested and passed the mental test fine, x-rayed results - hips Grade B, Elbows 0-0 and Patella 0-0. Thank you Marika for all your hard work and dedication to Jaffa and for reaching such a high standard in all disciplines. 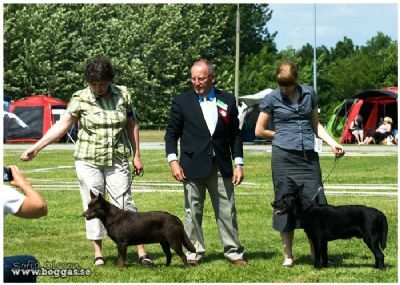 NV-07 BOB,CAC,CACIB at the NORWEGIAN WINNER SHOW 2007 held in Hamar, Norway - the judge Guy Spagnolo - Australia. Tilly is also qualified at tracking. Not bad for a coloured dog! TILLY's ten pups - eight of these pups have been x-ray/hipscored for "Grade A - one Grade A/B and one Grade B. 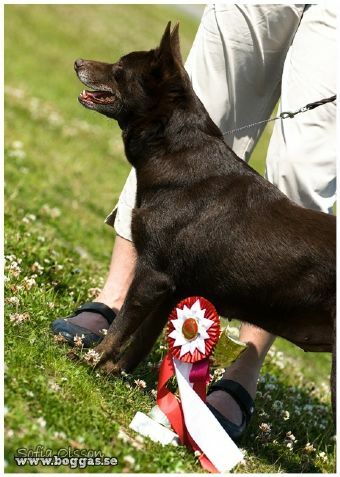 "WINGDARI DIGGERS XMAS" is GRADE A-HD FREE HIPS - Challenge Dog NORWEGIAN WINNER SHOW 2007 at 11 mths. "WINGDARI XMAS DOWNUNDER" is GRADE A - HD FREE HIPS.